The musculoskeletal system should provide a strong framework to protect, insulate, nourish and enable movement and exercise. Each type of ‘connective tissue’, including skin, cartilage and bones, has its own requirements to keep healthy. 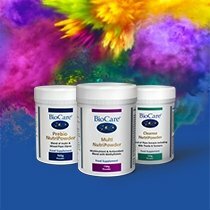 Whilst having a balanced diet is crucial to achieve that, joint and bone supplements from BioCare® can help ensure that you get the right amount of nutrients you need to optimise the health and wellbeing of all aspects of this vital body system. Our extensive range of supplements for joints and bones features complex formulas that were designed to combine essential bioactive ingredients with highly absorbable formats including capsules, liquid form or tablets. Our wide selection of joint and bone supplements includes calcium products with vitamin D, fish oils, glucosamine and MSM. Take care of your bones with Osteoplex, a bone supplement that features a powerful complex of magnesium and calcium, combined with vitamins D and K (importantly in K2 (menaquinone) form) all of which are nutrients that contribute to the maintenance of normal bone health. The innovative BioMulsion® JointGuard is a joint supplement that includes a unique combination of pure fish oil blended with glucosamine hydrochloride, vitamin E and ginger, which has been emulsified for optimal absorption. This supplement was created using our patented NEO-3™ process which utilises lipase enzymes to achieve a naturally concentrated and pre-digested formula. Achieve your recommended daily intake of vitamin D which contributes to the maintenance of normal bones, teeth and muscle function with Nutrisorb® Liquid BioMulsion® D, a potent liquid form of vitamin D that is emulsified for maximum absorption and superior bioavailability. MSM Plus is a supplement that combines MSM (Methyl Sulphonyl Methane), glucosamine hydrochloride and vitamin B6, which is suitable for vegetarians and vegans. 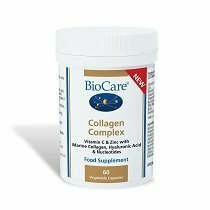 These are just some of the joint and bone supplements available at BioCare®. 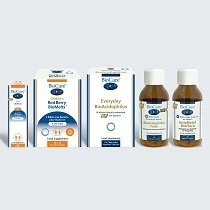 Discover the entire range below and learn more about their benefits and how they can help support good health for your musculoskeletal system in our Advice section.